If you’re like us and hate this time of year when adverts appear on the TV for that perfect dream holiday, where you sit by a pool with a good book, not a frizzed hair in sight and looking stunning, whilst your little ones jump safely and without concern into that beautifully peacefully pool. Then this blog is for you! 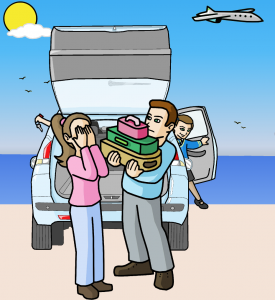 If your anything like us, before you’ve even got to the passport out of the drawer, you’ll be starting to panic about travelling with the children, especially hiring a car that fits all the luggage. And it’ll come as no surprise that we all start to question if we need a car seat because we are on holiday? Because we are in a foreign country? Because its only from the airport to the Villa? This is normally followed by a dash to google to search out other like-minded parents who are wanting the answers to the same questions. However, just because someone posts their opinion on social media, in a well-meaning comment – doesn’t make it fact. It also is worth bearing in mind that many discussion forums aren’t “policed” by industry specialists. This response suggests that any seat can be used, which isn’t the case. So what do the Civil Aviation Authority say? Well according to them, there isn’t an age limit, they must always be forward facing, even if it’s meant to be rear facing in a car. It must be able to be fitted with just a lap belt and always check with the airline before you travel. – Or our advice would be before you book the tickets! However, when you consider this carefully, how would a rear-facing infant carrier protect a child in a plane crash if it’s forward facing? As when you think about it logically, a car crash is completely different. Different speeds, forces and motions are involved. A car often has ISOFix points, and the majority have three-point seatbelts, not a lap belt like on a plane. However, fitting a child in a car seat may help you have a more comfortable flight and may help if the plane suffered turbulence. You also need to consider, the cost, if your new-born is using a seat on a plane you have to pay for the use of the seat. So do you take a seat on a flight or store it in the hold? STOP – is there any point? You first need to check out what safety standards are legally allowed at your destination. For example, in Florida, they don’t accept a car seat that conforms to the ECE standards that we have in the UK and across Europe. So unless your seat displays their safety standards it won’t be legal – sure it may work in a collision, however, your travel insurance may not agree to pay for any claim when they find out you didn’t have a “legal” seat! Hiring can be risky, but the travel insurance should be covered because the hire car company provided the product. Although we regularly hear about high costs based on a daily rate that the hire car company charge, so it may be better to buy one out there. Ask your travel agent or check out UK motoring organisations websites for the details on specific countries requirements and safety standards. So what if you’re lucky and you establish you can use your car seat? It’s a catch 22 situation because we all know how baggage handling isn’t the same as working in the fine china section of John Lewis. So ensuring its protected is essential. Again, get your agent to check with the airline as to their expected carriage of your seats – do you keep them with you until the last moment, similar to a buggy or will they take it at check in with your luggage? This will help you judge the best way to package it up. But don’t forget you’ll need to do the same on the return leg of your journey. Car seats are designed for cars, some take longer to fit with a seat belt than others, and they come in so many different shapes and sizes. From the airline’s point of view, they want to be able to board passengers as quickly and safely as possible. They also want passengers to be evacuated quickly and safely in an emergency, and if a car seat is going to stop this from happening and risk many people’s lives you can completely appreciate why they want them in the Hold. After all, you always told to remove your shoes if you use the shoot, so there’s no way your child is going to be allowed with their child seat down it! So, I suppose you’re all wondering what I did with my daughters when we went on our holidays. Well, because of this ( and a few other choices and issues) we chose to take our own car to France. We also holidayed in the beautiful UK. It was only for a short time until they were heavy enough to use a booster seat, which was approved in the UK and in the states. As soon as we arrived they used the booster and we popped along to the hypermarket and perused the High back seats available there. Don’t get me wrong, we wanted the holidays of a lifetime – but not at the cost of their lifetime.